From Middle English wir, wyr, from Old English wīr (“wire, metal thread, wire-ornament”), from Proto-Germanic *wīraz (“wire”), from Proto-Indo-European *weh₁iros (“a twist, thread, cord, wire”), from *weh₁y- (“to turn, twist, weave, plait”). (uncountable) Metal formed into a thin, even thread, now usually by being drawn through a hole in a steel die. A piece of such material; a thread or slender rod of metal, a cable. 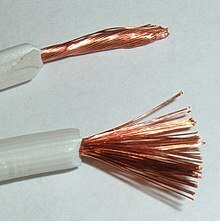 A metal conductor that carries electricity. A fence made of usually barbed wire. (sports) A finish line of a racetrack. (by extension) An electric telegraph; a telegram. (slang) A hidden listening device on the person of an undercover operative for the purposes of obtaining incriminating spoken evidence. (informal) A deadline or critical endpoint. (billiards) A wire strung with beads and hung horizontally above or near the table which is used to keep score. (usually in the plural) Any of the system of wires used to operate the puppets in a puppet show; hence, the network of hidden influences controlling the action of a person or organization; strings. (archaic, thieves' slang) A pickpocket who targets women. (slang) A covert signal sent between people cheating in a card game. To fasten with wire, especially with reference to wine bottles, corks, or fencing. We need to wire that hole in the fence. I could see him in his plane flying low over the river or a reservoir, dropping the club out with a chunk of lead wired to the shaft. To string on a wire. To equip with wires for use with electricity. To add something into an electrical system by means of wiring; to incorporate or include something. I'll just wire your camera to the computer screen. To send a message or monetary funds to another person through a telecommunications system, formerly predominantly by telegraph. Urgent: please wire me another 100 pounds sterling. The detective wired ahead, hoping that the fugitive would be caught at the railway station. To make someone tense or psyched up. I'm never going to sleep: I'm completely wired from all that coffee. (slang) To install eavesdropping equipment. We wired the suspect's house. To snare by means of a wire or wires. (transitive, croquet) To place (a ball) so that the wire of a wicket prevents a successful shot.